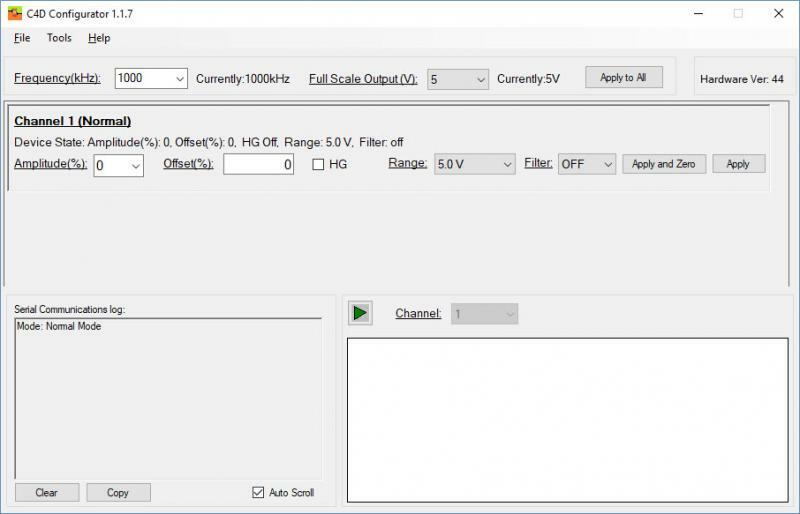 The C4D Configurator software allows the setting up of the operating parameters of ER815 and ER825 C4D Detector when they are configured with the serial firmware. This is when they are used with a third-party data acquisition system and software. It provides a simple alternative to the use of direct serial commands. This software shouldn't be used when the ER815 and ER825 are configured with applications firmware, or when using the ER225. This is when eDAQ software is used to record the signal from the detector. In these cases, the operating parameters should be set up in the PowerChrom or Chart software. Download the C4D Configurator software from the Software Download page. The procedure for using this software is shown in a video and has been written up as a pdf manual. The optimum excitation frequency and amplitude can be found using the seperate C4D Configurator software.